Mariska the Friesian is not acting, she is just doing her mischievous best to get to where she wants to be--in the feed room. But sometimes that can get a horse in a lot of trouble--like laminitis! Whenever the Animal Health Foundation presents a program on laminitis prevention, you will always hear Dr. Walsh say that there is one very simple thing that all horse owners can do to prevent laminitis. You might think he's about to prescribe a new medication, or a pasture plan or a high-tech pair of horseshoes. But he's not. In his best James Herriott voice he admonishes, "Each and every one of you should go home and put a lock on the door to your grain rooms." Horses know the routine. They also know where the grain lives. The type of laminitis caused by a horse's midnight feast on grain is known as "grain overload". This can be a very serious form of laminitis--and it is totally preventable. Veterinarians often get phone calls from worried horse owners who say, "Bobo got loose in the night and broke into the grain room!" The vet knows that the risk of laminitis is suddenly very real, and that time is of the essence, if the horse ate a sizable quantity or if was already at risk for laminitis. The vet also knows that the horse's binge could have been prevented. The worst calls, the ones that vets really dread, is "She got into the grain again." If your horse ever gets into the grain, call your vet immediately. She or he will give you instructions of what to do, both for potential colic and laminitis prevention. Follow those instructions, and say a little prayer. But today is the ideal day to check all the latches and locks on your horses' stalls and gates, and particularly the lock on your grain room door. Make sure it isn't a flimsy door, either, because horses can be destructive burglars. 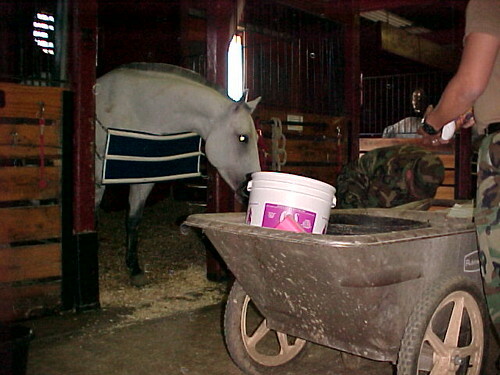 This is especially true of barns that portion out feed buckets at night for ease of feeding in the morning. The horses can probably smell the grain, especially if it's sweet feed. Keep grain in a bin with a latch. If you have to portion feed in advance, try to use buckets that stack inside each other, and put them into a latched bin. We all need to protect our horses from their own appetites--and their curiosity! As for Mariska, all's well that ends well. The feed room is now carefully locked and, in fact, all the locks and latches on the Misty Meadows Farm have been replaced so Mariska's mischief days are over...unless someone forgets! To think her owners put the grain in the freezer, thinking it would be safe! Thanks very much to Sandy Bonem of Midland Michigan, for both making the video and sharing it, and giving up so much follow-up information. We're glad that Mariska and her friends are both beautiful and smart, and hope that we'll see another video in the future. Be sure to read the followup blog post about Mariska and the popularity of this video, which has now been viewed over 600,000 times. Barn aisle photo by Paul Shillinger. 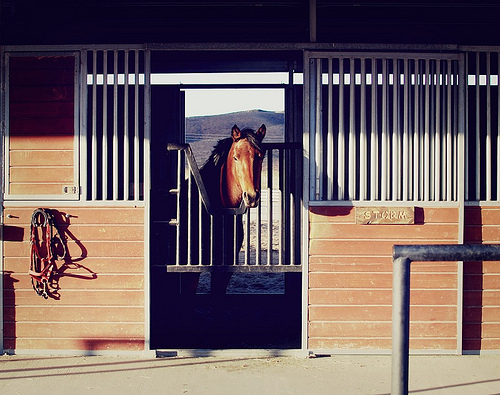 Horse in stall by Amanda Tipton.